After my lament of earlier in the week, I thought I should let you all know that, 1, I’m still alive; and, 2, the week has gotten better. I may be a touch bleary-eyed at the moment, but overall, the remainder of the week has been a massive improvement. The vet prescribed a course of antibiotics of colitis for Diana, and she seems to be feeling significantly better. The new tires, while expensive, do make the car much quieter, and somewhat more fuel efficient. And I had a good afternoon of learning with my bar and bat mitzvah students yesterday, so I’m looking forward to having more group lessons (it helps that a number of them are looking forward to the continuing group lessons). My only remaining complaint is that I still can’t find the cone of yarn for Eva’s second sock. This is beginning to drive me crazy, but I’ve looked everywhere I can think of. And I really want to begin this sock. 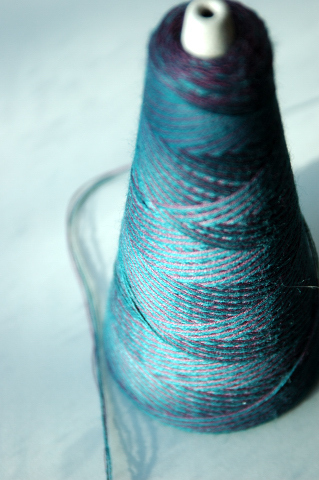 And it’s a custom constructed yarn at Yarnia, so it’s not like I can just wander out to the store and buy more. I am getting to the point of going over to Yarnia and seeing whether Lindsey and I can reconstruct the yarn, so the second sock will match the first. I’m looking forward to Shabbat, though it is very much a working shabbat. Tonight, though I’m not leading services, I’ll be present for the Jew Crew (our youth group) service. They’re leading it entirely on their own, and I’m pretty excited to see what they do. Tomorrow morning I lead services, and then tomorrow night, I’m performing a wedding. Meanwhile, CubeSpace will be mobbed with people for BarCamp. Eva will be working incredibly long hours this weekend, since BarCamp runs until 11PM tonight, from 9AM – 11PM tomorrow, and from 9 – 3 Sunday. She takes off Monday, but I’ll be back at CubeSpace. I am sorry I’ll be working throughout BarCamp, because it was a lot of fun last year (if exhausting), but there’s only so much one can squeeze into life. Oh, and Eva is going to be on a local public radio show this morning, Think Out Loud, talking about the economic slowdown and how it is affecting microbusinesses. All in all, life is about as busy as it gets. This is the project I alluded to earlier when talking about the yarn I “might” have bought when visiting Yarnia. And this is when I will do a little more talking about the yarn I purchased. I’ve now divided this into 2 evenly sized amounts of yarn (1 ball, and the rest still on the cone). And I’ve started knitting with it. The yarn knits very easily. The multiple plies are easy to work with and don’t separate much more than a plied yarn. It feels great to work with, even if it is a little less elastic until it is worked into the fabric. Regardless of the yarn being used, there is always something exciting about starting a new project. I know there is a lot of knitting ahead of me (which is a good thing), but I don’t really know how it will turn out, yet. I have a plan, and a sense of what I’m aiming for, but I know that the reality may look different from my expectations. Often, the reality is way cooler than my expectations. Almost certainly, it will be better than it looked while it was in process. Starting a new project starts this process. And I suspect that I will be continuing on this project for the next few months. Mainly joyously, occasionally dragging myself through it, always waiting to see what the socks will be. 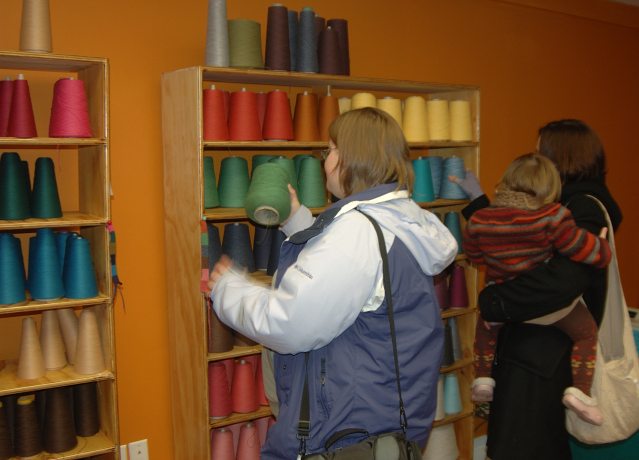 I visited the yarn store Yarnia on Saturday during it’s grand opening. Very cool! The concept is simple. 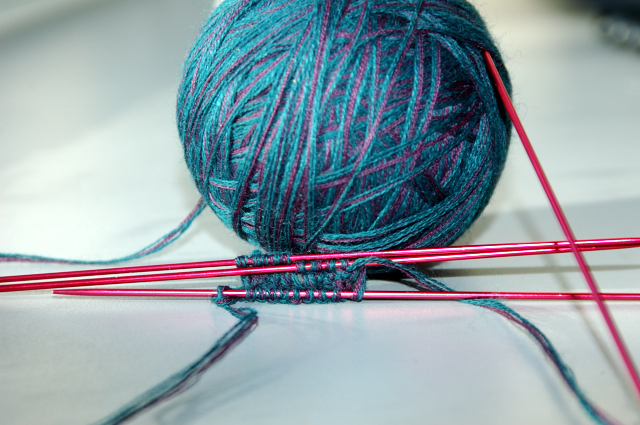 Yarn is made up of multiple strands of yarn which are plied together. 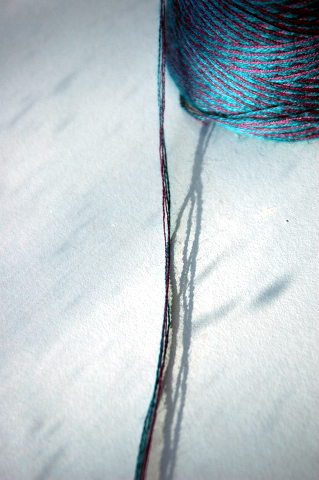 Most simple yarns are composed of multiple strands (plies) of the same yarn. More complex yarns often mix different colors, textures and thicknesses of yarn together. Yarnia lets the end consumer do the mixing. You choose the various strands, bring them to Lindsey, who runs them through her machine, and then hands you a cone of yarn with however much you ask for. And then she sells it to you by the pound. The process begins with selecting your strands. All of the ingredient yarns are on cones lining the walls. There are cones of wool, cones of cotton, mohair, alpaca, acrylic and various novelty fibers. There are lots of different colors to choose from. And as you select, you put the various strands together and begin to see what you’ve got, and how you like it. 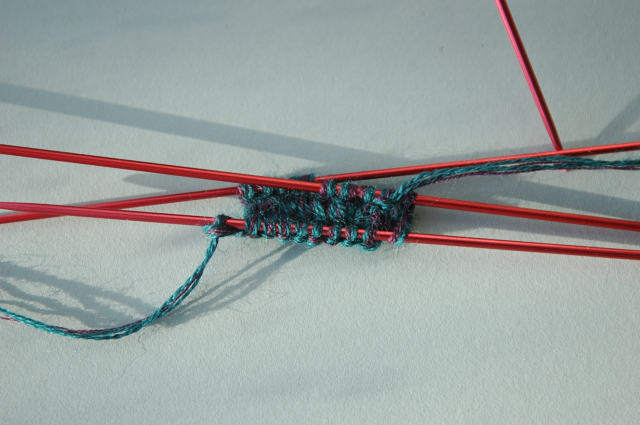 You can make the yarn as thick or thin as you want…creating a nice lace weight or some much chunkier. Equally impressive is the price. Most the yarn is between $22 – $32 a pound, which comes out significantly cheaper than most of the yarn you might buy at a local yarn store. For reference, a pound is probably enough for a sweater. While I was there, there were probably15 people through the store (I was there for half an hour to 45 minutes, probably). It seemed like the grand opening was hopping. Everyone seemed pretty excited. It was also great to to see some folks I knew in the store. One person recognized me from Ravelry, and I saw Aimee who showed up for knitting night at CubeSpace last week, and Larissa who has worked at CubeSpace occasionally. It is possible that I picked up a little bit of yarn for a future project, but I think I might discuss that at a future point. All in all it was a lovely way to spend part of a Shabbat afternoon. Shabbat (the Jewish Sabbath) begins at sundown each Friday night, lasting through sundown Saturday. It is a time of prayer and rest. A break from the business of the week, an opportunity to reconnect with your soul, your family, your congregation or the Divine. It is a day on which Jews traditionally do no work. This certainly remains true…but there is a difference between “I want to go to synagogue,” and “I have to go to synagogue.” There are weeks when I want nothing more than a Shabbat of rest, when I can catch up on sleep and rest, yet I am obliged to head out to synagogue. I’m pleased that as Shabbat draws near to day, I’m excited about heading down to Salem for services. This week, my schedule and my spiritual needs are well synched, and I’m eagerly anticipating services. I like the fact that there are various flavors to Shabbat…prayer versus rest; contemplation versus play. All are refreshing in their own way. I enjoy the fact that as a rabbi I have the opportunity to experience more of them than many people. Often, multiple on the same day. Tomorrow, after services, (prayer) I will proceed to play. As many of you know, my hobby is knitting. And knitting requires yarn. For you who come at this blog more from the Jewish side of things, let me explain about knitters and yarn: as books are to a rabbi, yarn is to the knitter. There is no such thing as “enough yarn.” Going and browsing yarn is an activity in and of itself, even if there is no intention to buy. After all, you never know what you might discover. Tomorrow, I will go play, because a new yarn shop is holding a grand opening. Yarnia is opening up, and I’m pretty excited to go explore. Yarnia is a new concept in yarn shops, which lets you blend your own yarn. You choose how many plies of which fibers and colors to mix. This is potentially VERY exciting (I do kind of already have some projects in mind that will be massively enhanced by having a sport weight yarn made from several fibers, one of which in a lace weight is used for another part of the same project). 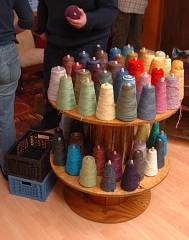 For me, this visit to Yarnia will be play. I probably won’t buy anything (I do try not to shop on Shabbat), but even just exploring it will help refresh me, and prepare me for the week to come. May the Sabbath be one of rest and refreshment for all of us, whichever day we celebrate it on.